Alternators make AC (alternating) current using a bridge rectifier with diodes to convert that AC current into DC (direct) current for use by the vehicle's electrical system. When your alternator's voltage regulator senses the need for electricity the regulator tells the alternator to start making electrical power. The alternator is then turned on and making electricity it taking power from the engine to generate the electrical power in the alternator, the more electrical power an alternator makes the more it costs. 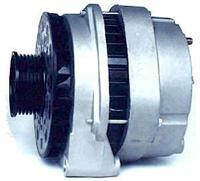 Here's where and how you loose some electrical power from your alternator. When your alternator is making AC power, which you pay for, and your bridge rectifier cannot transfer that AC power to DC it gets rid of it in the form of heat. You pay for generating power, then some of it gets wasted in the form of heat, because the alternator's internal rectifier is not efficient enough to transfer all the AC power, which you paid for, into DC power. To top it off, the more demand you put on your alternator the internal bridge rectifier becomes less efficient and more power is wasted. So if you are powering an HHO system or some other continuous demand system you are paying even more. 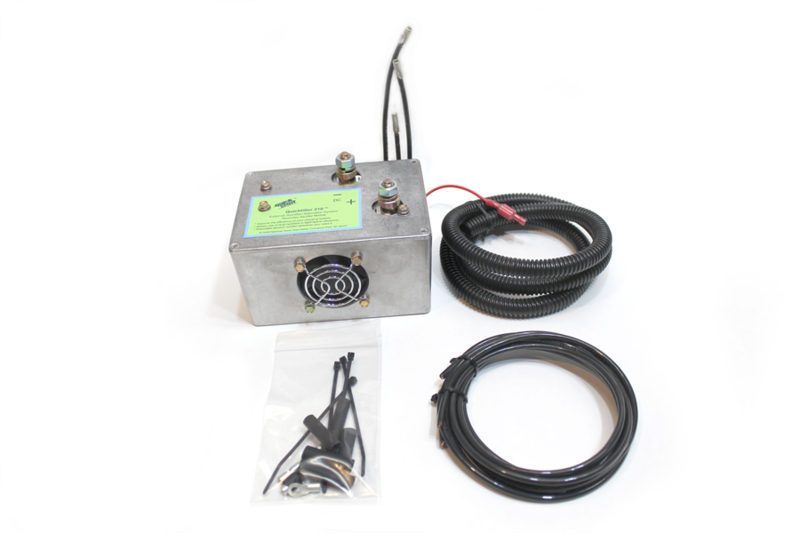 The Quicktifier 210™ and Quicktifier 420™ help recover that wasted power by tapping into the alternator stator leads where the AC power is generated. By taping into these AC lines before they go into the alternators internal bridge rectifier the external rectifier is offering a more efficient pathway out of the alternator in transferring the AC power generated into DC power. The increased throughput of higher amperage rated diodes, larger wires and a high volume fan to keep the external rectifier cool work together to create greater efficiency and less wasted power. The Quicktifier 210™'s rectifier is rated at 210 amperes, the Quicktifier 420™'s is rated at 420 amperes, much higher than any alternators internal bridge rectifier. Because of the recovery of formerly wasted power you can power your system, whether it's your stereo, HHO System, Emergency vehicle, or other high demand system for less money and less down time. The Quicktifier-210™ or 420 will make electrical systems work better and your alternator's bridge rectifier last longer. 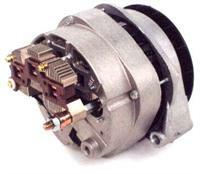 The Quicktifier 210™ or Quicktifier 420™ can be connected to just about any alternator by an experienced alternator technician. Our Unique external rectifier system helps recover wasted power from your alternator plus adds greater durability against bridge rectifier failure caused by heavy use. Disclaimer: Because of continuous improvements, actual product may differ slightly from photo. Delco Remy type CS144 series 350 amp extreme duty dual bridge rectifier alternator with standard voltage regulator. Delco Remy type CS144 series 140 amp Heavy Duty Single Bridge Rectifier (Rated at 210 Amps) Alternator with Standard Hook up Heavy Duty Voltage Regulator. 100% New, NO CORE CHARGE. Please give Year, Make, Model, Engine of your vehicle at the end of order. Delco Remy type CS144 series 200 amp Heavy Duty Single Bridge Rectifier Alternator with Standard Hook up Voltage Regulator. 100% New, NO CORE CHARGE. Please give Year, Make, Model, Engine of your vehicle at the end of order. Delco Remy type CS144 series 170 amp Heavy Duty Single Bridge Rectifier Alternator with Standard Hook up Voltage Regulator. 100% New, NO CORE CHARGE. Please give Year, Make, Model, Engine of your vehicle at the end of order.